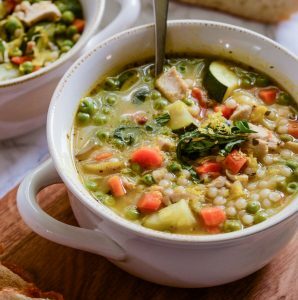 Enjoy soup even in the warmer months with this bright and fresh Lemony Couscous Soup with Chicken and Spring Vegetables. Plus, it makes a great get-well soup when you’re feeling unwell. Soup is probably the thing that we most often cook. When the first winds of autumn start breezing through town, our dutch oven hardly leaves the cooktop because it’s in constant use until spring. Once spring and summer come though, unless it’s someone has a cold, I don’t get to enjoy one of my all-time favorite meals – soup and crusty bread. Meet the cure in this Lemony Couscous Soup with Chicken and Spring Vegetables. It’s a great way to enjoy delicious soup even in the warmer months! Make this Lemony Couscous Soup with Chicken and Spring Vegetables recipe to perfection by gaining mastery in these culinary skills. Make Your Own Chicken Stock. This is a 5-part series on how to make your chicken stock to perfection! Poaching, Simmering, and Boiling: Cooking Methods 101. This soup has delicate temperature control to prevent the couscous from overcooking. Learn how to tell the difference. How To Buy & Store Fresh Herbs. This recipe isn’t complete without the fresh basil, which can be tricky to keep fresh. Learn all my tips for what to look for when buying it and how to keep it fresh. Basic Guide to Citrus Juicers. Get the most out of your lemons and find the right citrus juicer for you. How To Buy & Store Citrus. Since lemons are a key ingredient in this soup, learn how to find the juiciest ones at the market. Unless you’re making this soup for a crowd, it’s unlikely that you’ll eat it all in one sitting. You can keep the leftovers in the refrigerator for up to 3 days covered in your soup pot, or 5 days in an airtight container. Place your soup into a pot and place over low heat. Bring to a rolling simmer (about 20 minutes) then remove from heat and serve. Make sure to keep the heat low so you don’t boil in the lemon and make the soup bitter. Also, for the freshest flavor possible, I recommend topping your soup with extra freshly cut basil. This soup is my go-to recipe for when someone is feeling sick or under the weather. It’s also one of my favorites to gift to friends and family when they go through great changes (new baby, funeral, moving, etc…). No matter what the season is, this soup hits the spot. Get your free printable grocery list for this Lemony Couscous Soup with Chicken and Spring Vegetables recipe HERE. 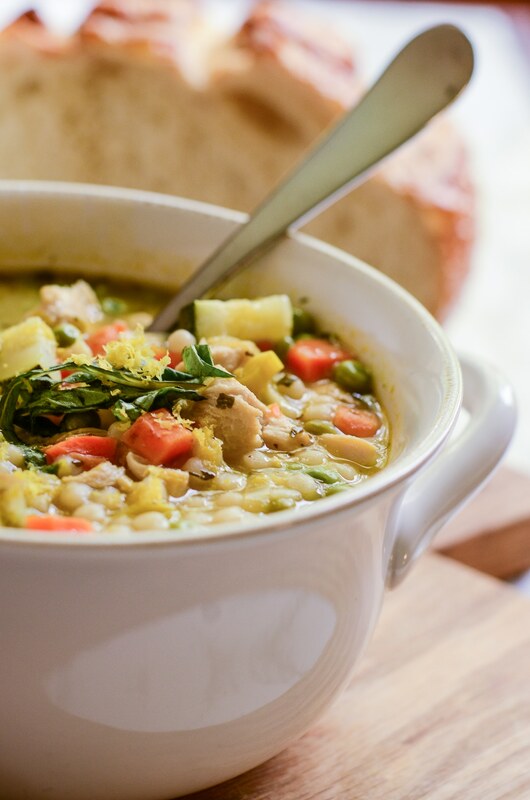 This grocery list has everything you’ll need to make this Lemony Couscous Soup with Chicken and Spring Vegetables recipe. To help in making grocery shopping simple, each ingredient is listed in easy-to-find grocery store amounts. If there is no amount specified, that means that you can buy the smallest (or largest) container available and still have plenty left over. Whatever the weather, this Lemony Couscous Soup with Chicken and Spring Vegetables is sure to hit the spot. Serve it with some toasted garlic rubbed bread and make it a meal sure to help you feel better in no time! In the bottom of a large heavy bottomed pot, heat the olive oil over medium heat. Stir in the leeks, carrots, and turnips and cook until the leeks just start to turn translucent, about 5 minutes. Stir in the garlic and cooked chicken and cook for 3 more minute, or until the garlic becomes extremely fragrant. Pour in one cup of the chicken stock and use your utensil to scrape up any caramelized bits that are stuck to the bottom of the pot. Turn the heat down to medium-low and add the rest of the chicken stock and the herbs de Provence. Let cook until the broth has reached a strong simmer, about 10 minutes. Immediately before serving sprinkle each serving with a tablespoon of freshly chopped basil. This sounds wonderful on a cold, blustery day and a nice alternative to chicken noodle. I also love your photography! Thank you, Jenni! 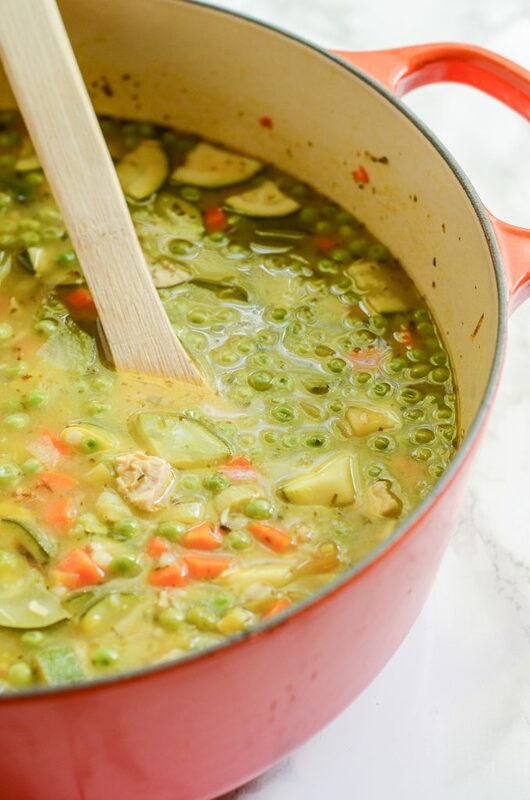 I love how easily this soup moves between seasons and can be easily enjoyed year round! This is a delicious combination of flavors. I love leeks in soup. They really add a lot of flavor. I also really love your choice of Israeli couscous for the pasta. I can’t wait to make this. I’m right there with you, Patti! 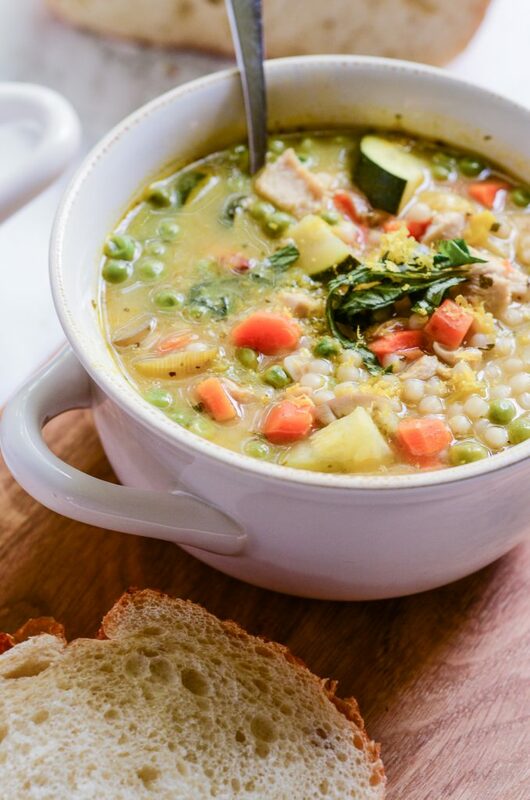 The leeks and the couscous just make for such a fun change up a chicken and veggie soup!